Each Fletchers’ Mill rolling pin is crafted from solid rock maple, and made in Maine, USA. Our rolling pins are available in a variety of sizes, diameters and styles. 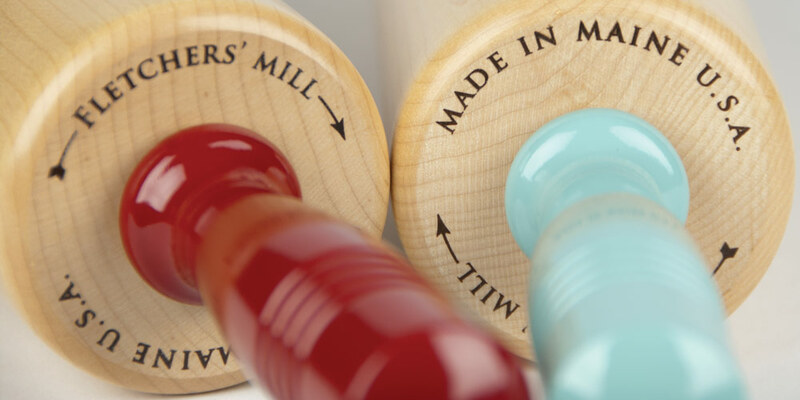 Each Fletchers’ Mill rolling pin is crafted from solid rock maple, and made in Maine, USA. Our rolling pins are the perfect tool for both the home baker and the professional chef. Regardless of your level of experience – hobbyist or professional – our rolling pin features will help make your job easier in the kitchen. Our Classic Rolling Pins are available in four sizes: 10”, 12”, 15” and 18”. Each is fitted with steel ball bearings to ensure a lifetime of effortless rolling. Our smallest rolling pin measures just 10″ in length and features a 2¼” diameter barrel, which is just right for smaller jobs. Our 12″ and 15″ rolling pins each feature 2¾” diameter barrels which make for perfect all-around use. Our largest pin measures 18″, also with a 2¾” diameter barrel, and is just what you need to get the job done in the kitchen when some extra weight is required. Our Specialty Rolling Pins are available in Bakery and French styles. The Bakery pin is 18½” in length and keeps hands close for good feel of the dough. The French pin is 20″ long, with tapered ends, and is the tool you want for rolling out thin, delicate pie crusts. We also offer a rolling pin designed especially for children to help out in the kitchen. An actual working rolling pin, our 7″ Children’s rolling pin is the perfect size for your young helper at home. And like all our other pins, this one is Made from New England hardwood right here in Maine, USA. After almost 37 years of marriage and many pies later, I finally had to replace my rolling pin. My original one was probably purchased at K-Mart or somewhere similar as we were quite tight with our money back then. As years passed, we had 2 children and I perfected my pie making. We never had birthday cakes, but, birthday pies and the old rolling pin served us well. Fast forward to 2017 and the old rolling pin goes to rolling pin heaven. I found your 10" Classic Rolling Pin at Pryde's in the Old Westport part of Kansas City, MO. The solid rock maple felt so smooth in my hand and the ball bearings made it so easy to roll. Today, is Father's Day and I made my husband a blueberry pie. Using the new rolling pin was almost like driving a new car after driving a 1980 model for years. As a daughter, granddaughter, sister and niece of proud New Englander's, I truly appreciate the quality craftsmanship of your product. Thank you for producing such a great American made item. If you love Fresh tortillas then our new tortilla pin is the perfect tool.